Here is a collab i did with ameth18.deviantart.com/. Familliar? it's the lineart i uploaded about a week ago and he decided to color it. About 25 yrs later, Princess Alice, Princess Alexis,Prince Gerry,and King Elias Acorn decide to take a picture together on the family couch. Elias is about 47, Alexis 26, and shadally twins 15 years old. About 10 yrs later, when the dark forces take over mobius, Agent Shadow is sent from the japanese govt to help the royal family and rescues Alexis, Megan, and Elias, and brings them all to safety on his ship (the ARK which is owned by the Japanese govt and given to Shad for a mission and later Shad owns it and renames it the Royal Acorn ARK). Later he does the same with Princess Sally, his future wife. However, he was too late to save Max and Alicia. 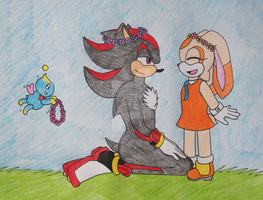 When Sal sees he saved her brother, niece, and sister-in-law, she begins to fall in love with shadow especially after her same feelings for him become deeper after he saved her, and calls him shad. Alexis begins to refer to her future uncle as Mr. Shad. Later on Alexis witnesses shad and sal's whole mission to save mobius to the very time anti-queen rosy puts a curse on Sally and launches her in to a deep sleep, in which alexis witnesses shadow waking up sal by kissing her on the forehead, which breaks the curse. When shad and sal get married, Elias presides and Alexis is their flowergirl. About several months later after their coronation, the new King Shadow and Queen Sally Acorn have twins, and Alexis witnesses their birth, how the new Princess Alice was named after Sally's mother alicia, how the new Prince Gerry was named after Shadow's creator Gerald, and holds each one of them gently in her arms and says "hi, im your cousin alexis" to them. 15 yrs later, A couple of times Alexis babysits for her now 5 yr old cousins, and watches tv and plays games with them. She meets and falls in love with guardian knuckles's younger brother kneecaps. alexis and elias belong to sega. Gerry and Alice belong to me. Not bad, I think that I would want to expect Sonally children in there but whatever. thanx, dude! and also thank u for giving my friend credit as well since I saw you did!